Hope you've enjoyed your bank holiday Monday! It's been a typical bank holiday today, freezing cold and rainy... Nevertheless I was still out shopping. I got a few nice bits, some accessories for my outfit for a 20s themed party I'm going to this weekend and of course a couple of nail polishes! The Models Own HedKandi collection is out now so I picked up two colours from that. I wanted one more but it was sold out in the Boots store I went to. Anyway, the polish I have to show you today is the second installment from my Nerd Lacquer order, Pinin' for the Fjords. This polish is about half way between grey and lavender and has purple (looks pinky in some lights), blue, grey and silver glitter. 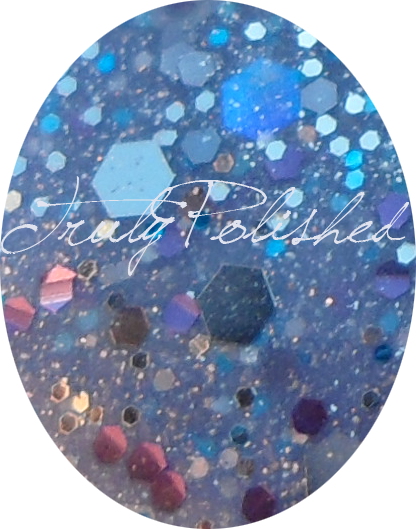 There is microglitter, small hex glitter and large hex glitter and it seems to change colour depending on the light and the base is very squishy and jelly-like which I LOVE! The application of this polish was amazing, I'm hoping all Nerd Lacquers apply like Resolutionary and Pinin' for the Fjords! I used two easy coats. You can see a bit of visible nail line in my photos but it really wasn't obvious in real life. The photos below show two coats of Pinin' for the Fjords with a coat of Seche Vite to smooth it out. What I love most about Nerd Lacquer polishes is that I have NOTHING remotely similar to them in my stash, they're so unique and the formula is just so good on all of them! Also, because of the different types of glitter, no two brushstrokes are the same so you get a totally different look for each nail! The Nerd Lacquer store on Etsy is currently on vacation but when it's back you can get Pinin' for the Fjords for $10.